One of my best friends is getting married so for her something blue I stitched her a pretty garter to wear on the day! We are lucky enough to have a VV Rouleaux shop in Bath where I picked up this gorgeous blue ribbon. As I didn’t want to lose too much of the blue I opted for a 5mm pink ribbon but it was quite tricky to get the elastic through, I eventually managed using one of my plastic needles I use for crochet! With a thicker ribbon this is actually much easier and you can just work it through by attaching a safety pin to the end of the elastic. This would also make a super fun activity for the hen do as you could hand stitch the garter, or all have a go on the sewing machine if you’re feeling crafty! Lace or a frilly ribbon. I used this Blue Organdy Frill from VV Rouleaux. Measure where you want to wear it on your leg and add 7 inches. Satin ribbon – choose depending on the thickness of your lace and it depends how big you want your garter! Again, measure where you want to wear it on your leg and add 7 inches. Elastic (thickness depends on the ribbon you choose) – you will need a piece 3 inches less than the leg measurement. Step 1: Measure out your ribbons and elastics. I was making one to fit 19 inches so I cut the blue frill and pink ribbon to 26 inches (adding 7 inches) and the elastic to 16 inches (minus 3 inches). This is so the frill and ribbon will ruffle nicely around the elastic. Step 2: Place the ribbon on top of the frill / lace and stitch all the way along the top of the ribbon and lace then stitch along the bottom of the ribbon. Step 3: Work your piece of elastic through the stitched ribbon. As I opted for a thinner ribbon it was a little tight but i eventually worked it through using a plastic crochet needle! With a thicker elastic just attach a small safety pin to the end and it’s easier to work through. Make sure you pin the end of the elastic when you have finished working it through so you don’t lose it! Step 4: Place the right sides of the ribbon together and stitch the ends together. Step 5: Turn right side out, snip off all the thread ends and even out the ruffles! Step 6: Your beautiful garter is ready for that special day!! I was having a clear out the other day and I found a couple of lumpy pillows destined for the bin….or so I thought! My pug Percy took an instant like to them, curling himself on top of them and making himself quite comfy! That gave me the idea to make a covers so I could dot them around the house like big floor cushions. Step 8: Turn right side out and put your pillow in for you pet to enjoy – here is Percy relaxing on his!! I wanted to make something to brighten up the dull days we get at this time of year – so what better nod to summer than neon pink flamingos?! I made these placemats reversible so I can mix and match the table setting – some matching napkins would work well too! I used a pom pom to hold my cutlery together or some pretty ribbon or lace would also look cute tied round in a bow. Step 1 and 2: Cut out 4 pieces of each fabric measuring 12 inch x 9 inch (feel free to play around with the measurements – I simply used some I had as a guide for the size that looked right on my table). Remember you will lose about 1/2 inch seam allowance. Step 3: Pin fabric right sides together. Step 4: Stitch around the placemat leaving a couple of inches as a gap. Step 5: Leave a couple of inches as a gap as you will use this to turn the placemat right side out. Step 6: Cut the corners. Step 7: Turn right side out. Step 8: Press and then use a ladder stitch to sew up the gap. It’s back to school time which we think of as a good excuse to make pretty stationery supplies! This pencil case uses the same method as our Quick Zipper Pouch – it’s just a bit thinner so it’s easy to chuck into your schoolbag. Step 1: Place the zipper at the top of the lining piece (right side up). Place the outer piece on top of the lining and zipper with the right side facing the zipper. Step 2: You should have the 2 pieces of fabric aligned so that the right sides face the zipper (I’ve pulled a bit of the fabric back in this picture so you can see how the fabric lines up). Step 3: Pin the fabric together and sew along the top of the zipper as close as you can to the zip part. When you get near the end try and nudge the zip open a bit as it can be bulky to sew past the zipper fastener. Step 4: You can see the pouch beginning to take shape. Line up the outer piece of fabric on the other side of the zip – again with the right side facing into the zip. Pin the other piece to the zip and outer piece of fabric – with its right side facing the zipper. Step 5: Lay the pouch out and open the zipper halfway. Fold the fabric back so the outer pieces are on top of each other (right sides facing) and the liner pieces are on top of each other (right sides facing). Step 6: Stitch along the edges leaving a small gap on one side. I started at the zipper so I could make sure I was sewing at the edge of the zipper (usually there is a metal bit near the end so you can sew up to that to keep it neat). Step 7: Turn the pouch the right way out. Step 8: Trim the edges and cut the corners into diagonals. This will make the pouch lay neat and flat. Then stitch the small gap closed. Summer is here!! With the current heatwave taking over England we’re inspired to create pretty things for the garden. 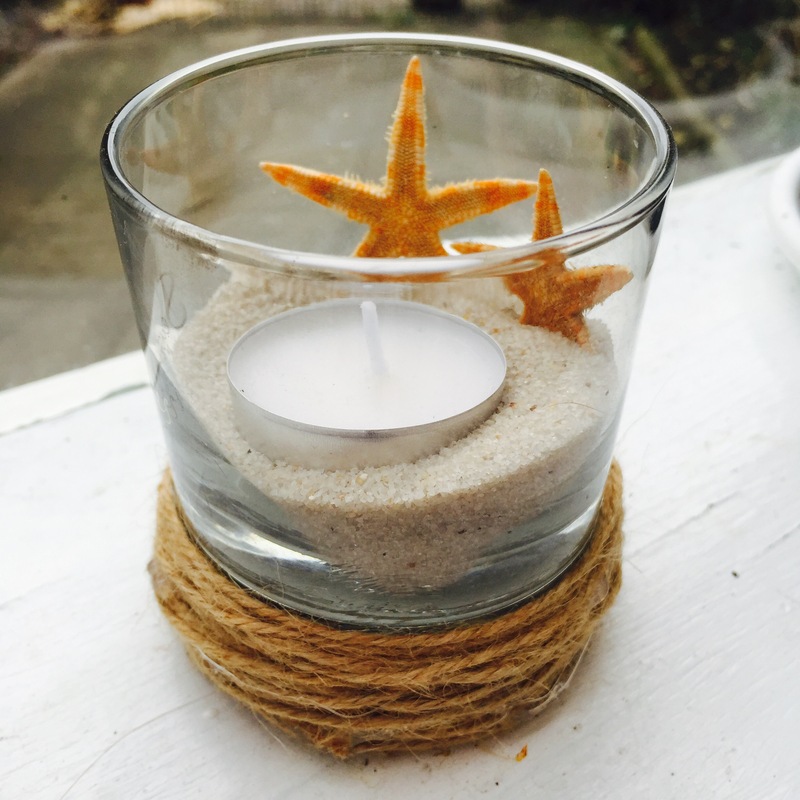 This tealight holder is so simple and can be created using things you may already have in your home. 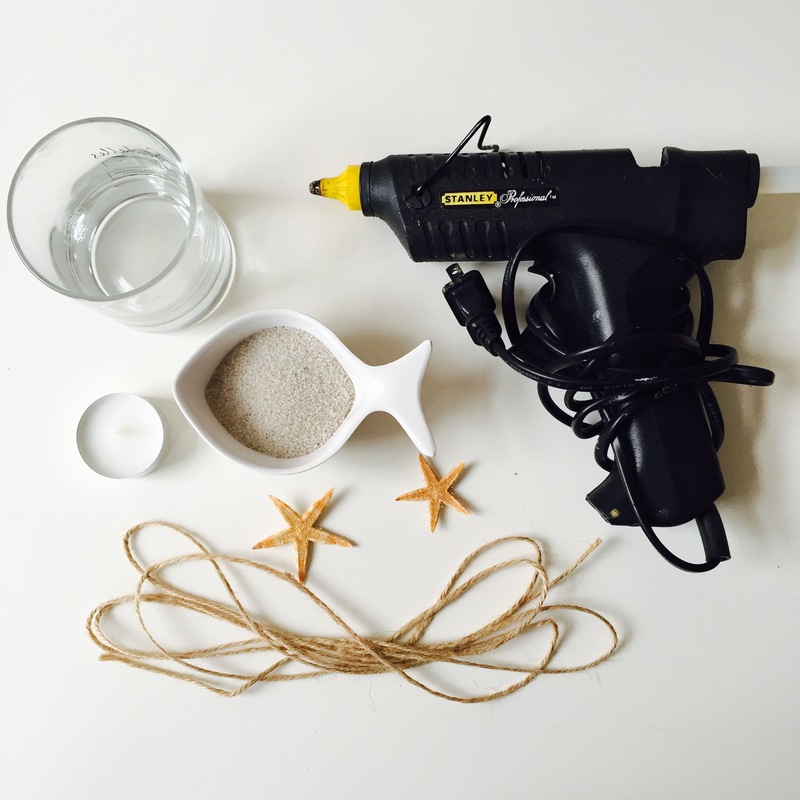 You could also add other things to it such as shells or even a few succulents. 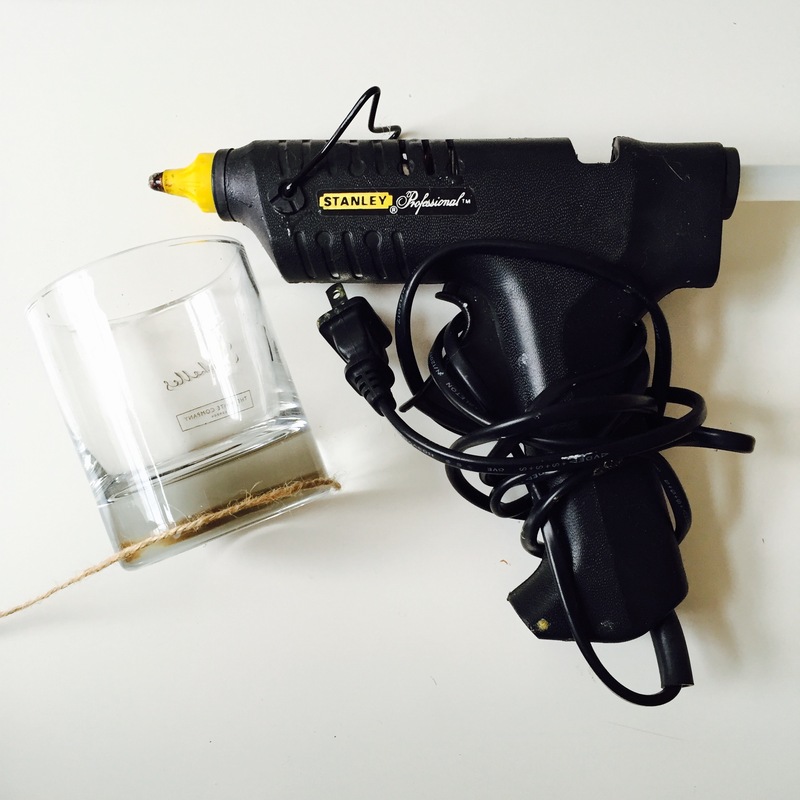 Step 1: Start by adding the hot glue to the glass. Then take the end of the twine and start placing it down onto the sticky glass (the glue will cool fairly quickly so wait until it’s gone to that tacky stage and then you can press it down without burning your fingers!). If I had any gaps I just kept gluing and wrapping the twine until the base was covered (about 1 inch high). Step 2: Once the glue has dried and your twine is all stuck down fill your holder about 2 inches deep with sand. Then place your tealights and any other decorations into the holder. This is so simple but really effective. These would also look beautiful as table centerpieces for a nautical themed wedding! I’m sure everyone used to wear a scrunchie at school – well the good news is that with the revival of 90s grunge fashions and 80s neons, scrunchies are making a come back! This tutorial shows you a really simple way to make one – I promise it will take less than half an hour! Cut a length of fabric 16 by 5 inches, iron and fold in half lengthwise with the righ sides together. Leave a 5mm gap at wither end and stitch along the long edge of the fabric. Turn right side out. Attach the safety pin to the elastic and use to pull the elastic through the length of fabric. When you come out the other side hold the elastic together with one hand and you’ll see the scrunchie has started to bunch up. With my other hand I just neatened out the bunching until I liked how it looked! Stich the elastic together (by hand or machine). Now this is the slightly fiddly bit. Put one end of the scrunchie inside the other and then fold over a hem on the bit of the scrunchie which is on the outside. Hand stitch around the the fabric – take care not to sew through all the layers, you just want to sew the fabric closed keeping the inside bit hollow. Get your hair up in a high ponytail and rock out your new scrunchie! !